This model, with high resolution scale and built-in Automatic Temperature Compensation ( ATC ) system, is developed for precise measurement of low Brix concentration. Can be used for fruit juice, soft drink, wine and most kinds of beverages. Can also be used for metal cutting fluids. 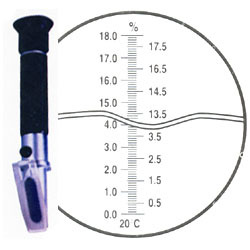 This refractometer is based on model CXM102 .